It is generally acknowledged that Korematsu v. United States is one of the most shameful decisions of the U.S. Supreme Court. That decision upheld the government's power to place U.S. citizens of Japanese ancestry in internment camps during World War II. In order to implement "every possible protection against espionage and against sabotage," American citizens of Japanese heritage who lived on the west coast were ordered by the military to leave their homes and businesses and report to "assembly and relocation centers." Fred Korematsu was one of the people subject to the order, and he balked. He was subsequently convicted in federal court of remaining at his home in San Leandro, California. Korematsu appealed his case to the U.S. Supreme Court, where amicus briefs were filed on his behalf by a team of lawyers organized by the ACLU. The team included Edwin Borchard, Charles Horsky, George Rublee, Arthur DeHon Hill, Winthrop Wadleigh, Osmond K. Fraenkel, Harold Evans, William Draper Lewis, and Thomas Raeburn White. These attorneys were among the elite of the legal profession. Some were members of elite law firms of the type that represent some of the Guantanamo detainees today. Charles Horsky had been a clerk to Augustus M. Hand and was a member of the corporate firm of Covington & Burling. Osmond K. Fraenkel was a partner in Goldsmith, Jackson & Brock. Thomas Raeburn White was a founding partner of White & Williams. Others, such as William Draper Lewis and Edwin Borchard were legal scholars at Ivy League institutions. George Rublee was a corporate lawyer who held various government posts throughout his career. 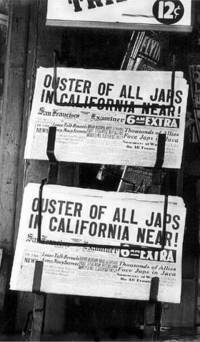 Korematsu was not excluded from the Military Area because of hostility to him or his race. He was excluded because we are at war with the Japanese Empire, because the properly constituted military authorities feared an invasion of our West Coast and felt constrained to take proper security measures, because they decided that the military urgency of the situation demanded that all citizens of Japanese ancestry be segregated from the West Coast temporarily, and finally, because Congress, reposing its confidence in this time of war in our military leaders -- as inevitably it must -- determined that they should have the power to do just this. There was evidence of disloyalty on the part of some, the military authorities considered that the need for action was great, and time was short. We cannot -- by availing ourselves of the calm perspective of hindsight -- now say that at that time these actions were unjustified. Today, the Korematsu case, along with the Dred Scott decision, is considered to be one of the most egregiously wrong decisions in the Supreme Court's history. In 1993, President Clinton issued Korematsu an official apology, which read, in part, "In retrospect, we understand that the nation's actions were rooted deeply in racial prejudice, wartime hysteria, and a lack of political leadership." Korematsu was subsequently awarded the Presidential Medal of Freedom. We were dead right as it turned out…The government's case basically relied on the fact that…things has been happening in California that suggested that we had to move all the Japanese out of California. There was a report written by the commanding general of the [Western Defense] Command named [Lieutenant General John L.] DeWitt [that] outlined a lot of reasons why it was necessary to remove the Japanese, some of which I knew were false. For instance, DeWitt said there were suspicious lights moving about on the coast which were probably signals to submarines lurking along the shore. I found out to my satisfaction that the lights were Japanese kids, or maybe not even Japanese kids but kids, going to outdoor toilets at night with flashlights. The government used [the DeWitt Report] but they didn't really say it was all true…In argument I did not quite say that I thought [Solicitor General] Charles Fahy, who argued the case for the government, was misleading the court, but I came close enough so that Mr. Fahy didn't speak to for me years afterwards. They were generous almost to a fault. If you have an opportunity to do something interesting, they say for God's sake go ahead and do it. It's a wonderful firm for that. Had Charles Stimson been around in those days, he probably would have attacked Horsky and the other elite attorneys who represented Korematsu. The principles are the same; only the dates, names and nationalities are different. If the bulk of the detainees are guilty of nothing but being in the wrong place at the wrong time, if there's no evidence that some of them did the things of which the government has accused them, then it would mean that we locked innocent people in a hole for five years. It would mean not only that our government wrongfully imprisoned these men but that the rest of us stood idly by as they did it. It would mean that we have learned nothing from Korematsu v. United States, that we have learned nothing from the McCarthy-era witch hunts, and that when we wake up from this national nightmare, once again we will marvel at the extremism we tolerated in defense of liberty. It would mean that even as we extol the virtues of fairness and due process abroad, we take away those very rights from people on our own soil. Charles Stimson has issued a patently insincere apology for his actions. Perhaps he was also inspired by Korematsu; if that's the case, it seems likely that he was inspired by the court's infamous majority opinion, rather than its dissent.